A new path to a doctoral degree being offered by the University of New England (UNE) enables pest animal specialist Darren Marshall to upgrade his skills from his ute, chasing pigs. Darren, a Senior Project Officer, Pests and Biodiversity, with the Queensland Murray-Darling Committee, is undertaking UNE’s Doctor of Philosophy – Innovation (PhD-I), which allows candidates to earn their doctorate from their workplace, without sacrificing academic rigour. As Dr Philip Thomas, UNE’s PhD-I coordinator, explains: “This is a PhD now offered by UNE. The research constitutes a significant scholarly contribution to knowledge within a described professional, industry or specific context. It produces valuable new knowledge, with the candidate learning the principles and skills of doctoral level research within the journey”. “But unlike a traditional PhD, the PhD-I is specifically designed to encourage the distribution of knowledge directly to industry. There is embedded engagement with direct and tangible research impact”. 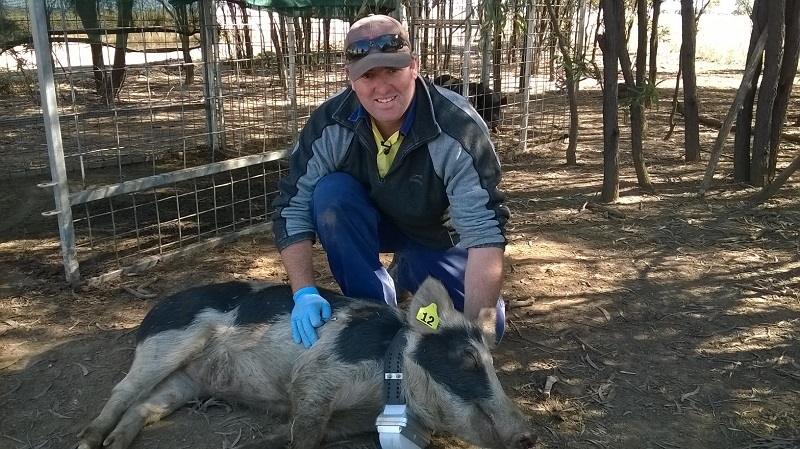 Darren’s PhD-I involves collaring and tracking feral pigs to learn more about their ecology and behaviour, and then sharing his findings with landholders. His unique blend of science and social science research, involving community engagement, will hopefully bolster pig control efforts and significantly reduce the impact of these destructive pests, as he explains. “After 12 years of trying to get people to work together and organising feral pig control measures, I didn’t feel like I was achieving either a reduction in pig numbers or an improvement in agriculture or the environment. I decided we need to crash the science and the community work together. There’s brilliant science happening out there, but the community don’t get to see it or utilise it as much as they could. The PhD-I model allows me to make my research really useful and practical. I collared my first pig a year ago and now have 100 collared at eight sites in northern NSW and southern Queensland.As part of our collaring effort, I try to collar big, charismatic boars that capture people’s hearts and minds, and the pigs then become my media managers. They engage everybody, so that when we come to do a control campaign, everyone knows about it. There are so many myths about where pigs live and travel, but my collars tell you the truth. Pig movements vary across sites, depending on the food, water and shelter available, but when they have all three it’s not usually much more than 10 kilometres. But because they breed so fast, unless you take out at least 70% of the population, you don’t have any impact. One sow can have two litters of 10 piglets each per year, so they can colonise areas fast. I reckon there are between 10 and 15 million pigs across the country, damaging crops and fences, eating pastures and lambs. It’s hard to put numbers around the cost to biodiversity. Landholders are captivated when I put the data up on a screen, because it’s their property and they can see exactly where the pigs are going. When they begin to take an interest, and realise that pigs live everywhere, not just in national parks, they’re more likely to participate in pig management. Then we can work together to target pigs more effectively. It’s early days and it’s cheeky for me to say it, but it’s working. It’s engaging landholders and we’re gathering good data. We can’t go out and create a collaring project everywhere, but we can create case studies of our sites that will hopefully influence landholders in other areas. I feel like I am empowering farmers with science. The PhD-I model is brilliant. It provides such a practical way to study, and the best thing is that you have to do it at work; it’s an innovation that you need to be able to implement in the real world to bring about significant change on-ground. I wouldn’t have been able to leave work to study. With the PhD-I, I can maintain my career progression and still pay off the house. It’s improving me, and I’m not losing but building new contacts and opportunities. I can’t tell you how much my career has progressed since I started this PhD-I; it’s just amazing. And it’s certainly bringing in more and more work for my employer. The contracts that I have brought in have at least doubled since I started. It’s now about managing time and the workload and building a team.